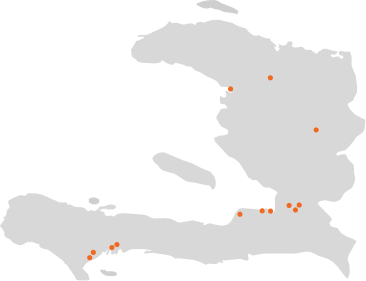 Less than a 2-hour flight from Florida, Haiti is located on the Caribbean island of Hispaniola. While Haiti’s “mountains beyond mountains” and rugged island beauty are breathtaking, poverty is a tangible force in the daily lives of most Haitians. Historical French colonial exploitation, decades of ineffective government, and natural disasters are just a few contributing challenges in Haiti. With more than two-thirds of adults lacking formal jobs, many cannot afford to care for their children, let alone pay the required fees for education. Less than 50% of children in Haiti attend school. In spite of economic struggles, hope and resiliency are strong among Haiti’s people. And Haitian churches are rich in faith and actively ministering to their communities. The Global Orphan Project’s local church partners provide family-style, culturally relevant care and education for orphaned and vulnerable children at 14 sites across Haiti. Haiti is also home to the Transition Academy, a 2-year vocational-technical school for young adults who have aged out of orphan care, and LIFE, the partner manufacturing facility for GOEX, our apparel company created to provide living wage jobs and send all profits back to care for kids.